Check out the new music on order for the Springfield City Library. Place your hold now! Women@Work: Influence and Impact is a city of Springfield-wide collaborative of programs, exhibitions, and gatherings celebrating the power of women. and community-building and social outreach. how she changed how artists perceive and portray women. and businesses led by women. calendar of exhibits and events highlighting the work women have done and do today. Please join us to celebrate the influence and impact of Women@Work. Click here to view the Women@Work events calendar. Special thanks to TSM Design for the Women@Work logo. Central Library visitors will enter through Quadrangle door starting December 12. Visitors to the Springfield City Library’s Central Library should enter through the door facing the Springfield Museums, starting December 12. Doors on State Street will not reopen until the next construction phase is complete. The Library’s newly constructed ramp means that pedestrians and wheelchair and stroller users alike can enter the building on the Quadrangle side. Museums staff welcome library visitors to park in their lots on Edwards Street. Accessible parking for vehicles displaying a license plate or placard is in a small lot between the George Walter Vincent Smith and Springfield Science museums; enter through the State Street driveway. The new ramp is part of a renovation of the historic Central Library which opened in 1912. The City of Springfield is funding the project, with supplementary grant funding from the Massachusetts Cultural Council through its Cultural Facilities Fund. Besides the ramp construction, ongoing improvements include remediation of water leaks, replacement of a worn roof, and restoration of cornices lining the roof profile. The next step dismantles and restores the marble staircase on the State Street side of the building, necessitating the closure of the surrounding doors for public safety. The Central Library, located at 220 State Street, is the headquarters for Springfield’s nine-location system. It remains open its regular schedule during construction: Mondays and Wednesdays, 12 to 8; Tuesdays, Thursdays, and Saturdays, 9 to 5; and Sundays, 12 to 5. The Massachusetts Cultural Council is a state agency. Founded in 1857, the Springfield City Library provides nearly 5000 educational and recreational programs per year. To learn more, visit www.springfieldlibrary.org. The Teens’ Top Ten is a “teen choice” list, where teens nominate and choose their favorite books of the previous year! 2018 Teens’ Top Ten list announced! Nominators are members of teen book groups in fifteen school and public libraries around the country. Nominations are posted on the Thursday of National Library Week, and teens across the country vote on their favorite titles each year. Readers ages twelve to eighteen voted online between August 15 and Teen Read Week™ (October 7-13, 2018) on the Teens’ Top Ten site. The Teens’ Top Ten is a project of ALA’s Young Adult Library Services Association. For more great reads visit their Teen Book Finder Database. Download a pdf file of the Teens’ Top Ten list. Admits: 5 people, any age. Pass must be presented with a valid photo ID at the entrance; children 17 and under must be accompanied by an adult. May not be combined with any coupons or other offers, or used during paid special events. Pass privileges include a 10% discount at the gift shop. Note: The pass does not cover the parking fee to enter Forest Park. Please check the list of parks available with the pass in the catalog description. The pass entitles the bearer to free parking for one vehicle (excluding buses and 15-passenger vans) at over 50 day-use facilites in the State Parks system that charge a parking fee. Pass valid for $5.00 off per person for up to four people. Good on general admission only. This offer cannot be copied or combined with any other offer. Pass cannot be used for special events and programs. Pass must be presented at time of admission. Pass may only be used once per day. Open daily except for Thanksgiving and Christmas. Hours vary, please see the Aquarium’s website for hours. Admits: Free admission. Limited to parties of 9 or fewer – 1 pass per party. Wistariahurst Museum offers docent-led tours of the house during regular operating hours with open hours every Saturday, Sunday and Monday between 12 and 4 p.m. Gardens and grounds open daily until dusk. Hours vary according to season. Contact museum for hours. Pass admits two adults. Valid for admission to one house tour OR one lecture, workshop, or concert (Reservations required for lecture, workshop, or concert admissions). Library Pass not valid for admission to fundraising events and select partner events, including the Nutcracker. FYI – Springfield Residents always have free general admission to the Springfield Museums. Five world-class museums, including the Amazing World of Dr. Seuss Museum and the Dr. Seuss National Memorial Sculpture Garden are located right downtown next to the Central Library. Free general admission for Springfield Residents during regular museum hours with valid ID. Visitors ages 3-17 accompanied by a non-Springfield resident adult must present a Springfield school ID. New artist renderings of the plaza are available for public viewing. The Central Library is currently undergoing renovation, repairs, and construction. Part of the project includes tearing down the old, unsafe entrance ramp at the northwest library entrance (facing the Springfield Museums). The old ramp will be replaced by a new accessible ramp, stairs, and plaza connecting to the Smith Museum. Construction is expected to be completed in August 2018. 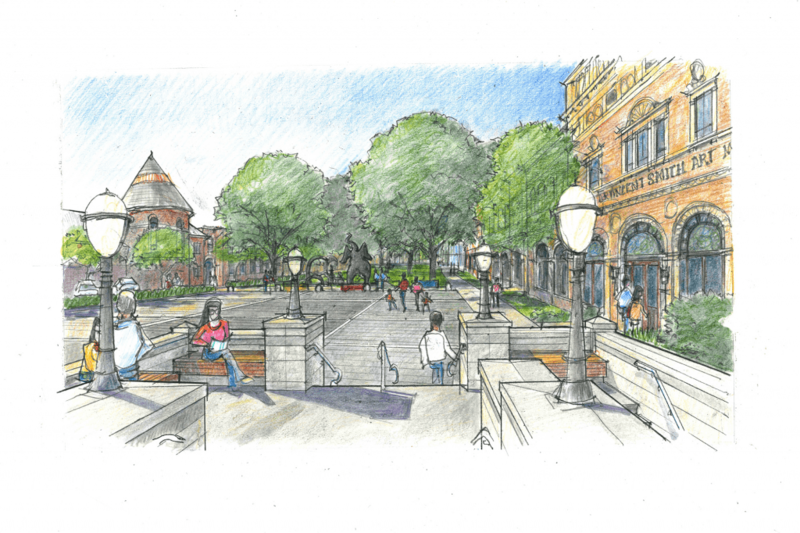 Artist rendering of the Central Library Plaza looking out toward the Springfield Museum Quadrangle. 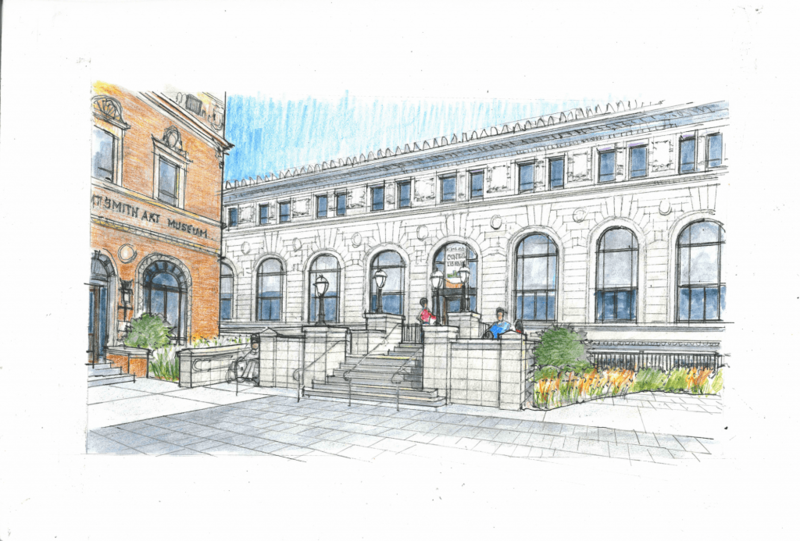 Artist rendering of the Central Library renovations looking towards the library. Springfield City Library is pleased to announce its inclusion in the Digital Commonwealth, beginning with the digitization of City of Springfield directories. City directories list addresses and business ads, and are used by genealogists, historians, and others researching people and places of the past. Digitization provides an easy way for the public to look through directories online. Once the project is complete in 2017, a full listing of the City of Springfield directories from 1849 – 1989 will be available in the Internet Archive. Directories from 1849-1869 are available thanks to the generosity of Maggie Humberston at the Wood Museum of Springfield History. The Digital Commonwealth site provides access to thousands of images, documents, and sound recordings that have been digitized by member institutions so that they may be available to researchers, students, and the general public. Digital Commonwealth members receive free digitization services from the Boston Public Library as part of a grant awarded by the MBLC (Massachusetts Board of Library Commissioners) and funded by the LSTA (Library Services and Technology Act). Member institution’s collections are included in the Digital Commonwealth, Internet Archive, and Digital Public Library of America. Explore the Digital Commonwealth here. Visit our Local History and Genealogy page (coming soon) for more information about our collections. Founded in 1857, the Springfield City Library provides over 800,000 free print, physical, and digital resources for public enrichment. When Springfield City Library’s network, C/W MARS, doesn’t have an item, residents can use the Commonwealth Catalog to search through all participating libraries in one easy step and sort results by books, audiobooks, or DVDs. Next, they simply request the item and it’s delivered right to any Springfield City Library branch for pickup, usually within a few days. Last year, residents borrowed 6.5 million items from libraries outside their own community. While Commonwealth Catalog provides books, audio books, DVDs, and CDs, Massachusetts libraries also provide a wide array of digital resources including eBooks, research databases with information not available through standard online searches, language courses, streaming music and video, and more. Digital and material resources combine to give residents access to over 52.5 million items. Frequently asked questions are addressed on the Commonwealth Caalog’s FAQ page.